There was surprise and some puzzlement in the Chicago food community late last year when Dave and Megan Miller revealed that they were selling their successful and critically acclaimed Bang Bang Pie and Biscuits shop in the Logan Square neighborhood, less than two years after they opened it. But the married couple let it be known they were not leaving the baking business — but rather were segueing to a new location… and a new concept. Baker Miller, which is nearing its grand opening a bit farther north in Lincoln Square, has an elevated Good Food mission. The owners opened their doors to the public on Sept. 22. 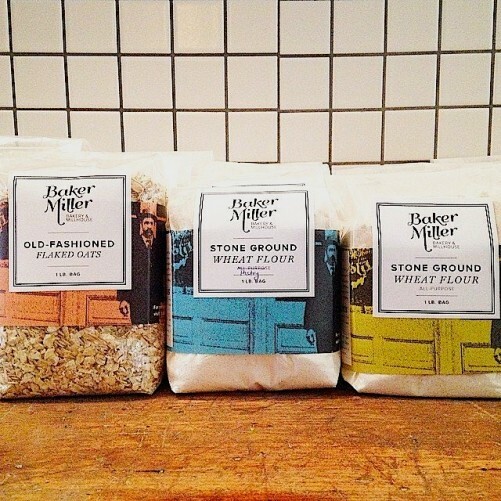 Baker Miller actually is a two-pronged operation: a flour mill making high-quality products from regionally produced grains, and a restaurant and bakery selling products made with those grains. Dave Miller explains the concept in the following q-and-a with FamilyFarmed.org’s Grant Kessler. Kessler: So give us a quick rundown about the kind of place Baker Miller will be, and who’s behind it. Miller: Great, thank you! Actually, I should start by clarifying. We are actually opening two different companies for very different reasons. First, we’re opening Baker Miller. It’s a grain-centric bakery/restaurant. Then we’re opening Baker Miller Flour Company. It’s an employee-owned flour company. Baker Miller is just Megan and me. 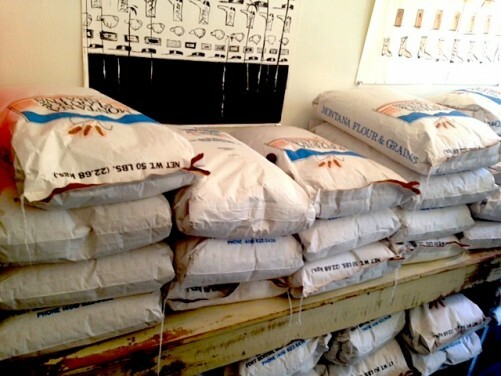 We want to use it to sell goods made with Baker Miller Flour and to promote balanced eating and food education. 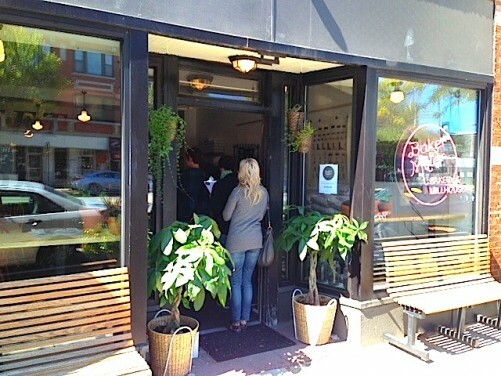 We expect it to stay small and be a neighborhood/Chicago focused restaurant. We are the sole investors in Baker Miller and we guard it, because we want it to remain creative and something we own together. Baker Miller Flour is as big as we can possibly make it and we have no boundaries. We have begun raising funds to launch it through both investors and through Kickstarter. Our hope is that we can build a community around Baker Miller Flour. Kessler: FamilyFarmed’s Good Food Festival and Conference this past March featured ancient and heirloom grains in numerous sessions, because we want to see production of these grains increase and we want to see more people working with them, both commercially and in the homes. It sounds like you’re on the same page. Talk about the grains you’re sourcing and the milling you’re doing. Miller: I was recently offered over 2,000 pounds of wheat from an anonymous source. I had to decline because it was hybridized wheat grown with chemicals and stored for over a year. So yes, we support grains that have been either grown with organic or better practices and non-GMO wheat. It has proven hard to get wheat not modified, so a part of our business plan is to actually help purchase heirloom and ancient varieties of seeds for farmers to grow. It means we take on some of the risk, but we know exactly where the grains came from and we create the market for the farms. Kessler: Why take this artisanal sourcing and milling approach to grains? Miller: Because we’ve seen the effects first-hand. I hate to say I have to see it to believe it, but I’m a pretty skeptical person. If you told me flour was bad, I probably wouldn’t believe it unless you showed me why. After baking with over 50,000 pounds of flour —and seeing the damage it has caused — I believe it. I’ve personally suffered and experienced health issues from eating the food I used to serve. Most of our ingredients were good, but after lots of research, I began to realize that our main ingredient was lacking fiber and that it was manipulated to be something unnatural. The minute I switched to whole-grain eating (along with fermented eating), I noticed a better quality of life. I think the key to this is eating whole grains along with balanced diets. 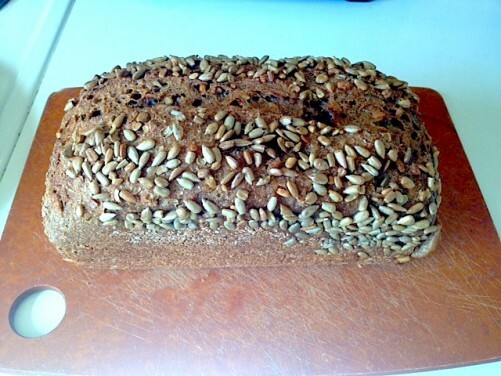 Kessler: What are the differences and challenges of working with freshly milled ancient and heirloom grains? Miller: Oh, man — that’s a very good question. Actually, if I just milled and sold grains without any blending, you’d almost have a completely different product. They absorb water differently, have a different texture, taste different and react to gluten differently than commercial flour. I sift and blend to create more stable flours and sometimes take out a little bit of the bran to make it work better for home cooks. People don’t know this, but whole wheat flour actually has things in it that counteract gluten. I think many of the gluten issues currently happening have more to do with taking out the gluten counteractants than anything else. Obviously, some people are actually celiacs, but I think many others are cutting wheat out of their diet when they should be focused on purchasing and eating proper whole grain wheats grown without chemicals. Kessler: Are you seeing great flavor profile differences? Miller: It’s a little hard to tell and it depends on the wheat. There are many types, but our two main types are organic soft spring wheat and Hazzard Free hard spring wheat. Our soft wheat is incredible and its texture is so much better than traditional pastry flour, but its taste differences are subtle. It is a bit sweeter. Our hard spring wheat is much more straightforward. Its taste profile is way more distinct, though, and it’s very nutty. It makes incredibly flavorful bread. Our rolled oats are way different than the normal Quaker Oats you buy. They have notes of molasses and cinnamon and taste absolutely incredible. I thought I didn’t like oats. Turns out, I just like freshly milled oats grown by farmers who care about their taste. Our corn is definitely better as well. I made grits for a group of people the other day and they were incredible. They were sweeter and way more aromatic than normal grits. They had the starchy corn sweetness that you’d think corn should have — but often doesn’t with store-bought products. One of the best parts about this whole thing is that we’re actually promoting a better product more than even a better way of eating. It sells itself. Kessler: And you’re committed to seeing home cooks milling their own grains. Why is that important? Miller: Yes, I think it’s great for people to mill at home. Our flours are great, but I think there’s something to be said about being as connected as possible to our food. We’ve become distributors of the Komo Mills we use for milling in the shop. They’re probably a little pricey for the average consumer, but for the avid baker or home cook, I think they’re amazing. Our freshly ground grains are phenomenal and taste great, but there’s nothing like the flavor and smell of a grain the second it is ground. I also think having creative control over grains helps cooks think about the texture of foods. When you can mill things to any grain size, it allows you much more creative control over the final product. 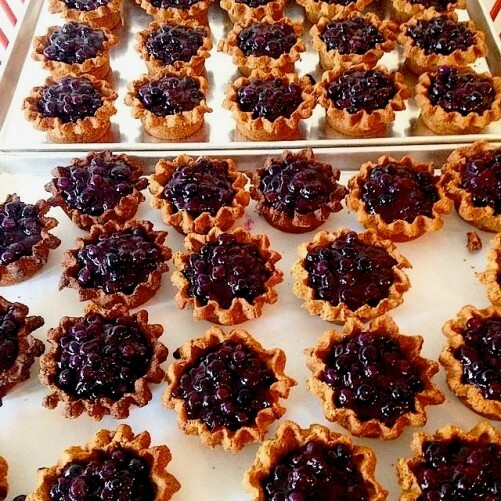 Kessler: You commented recently on the Mark Vetri article on Huffington Post about gluten intolerance and we understand there is a high frequency of gluten sensitivity among pastry chefs. What are your thoughts and experiences with the wheats you’re working with? Is a return to ancient grains, simpler processing, and fermentation a solution for people? Miller: Yes, I believe that a return to grains can actually help heal some intolerances. I’m not a scientist and I’m hoping that someone can eventually prove it,but I believe that a whole grain diet can be healing. It has definitely helped me. I also eat a lot of fermented foods and have found that they are a part of a balanced diet for myself. Kessler: When can we come eat at Baker Miller? Miller: We’re opening in September and we’re so excited to show the city what we’ve been working on and learning. Baker Miller Bakery and Millhouse is located in Chicago’s Lincoln Square neighborhood at 4610 N. Western Avenue, just north of Wilson. They plan to open every day during their first week in operation, then go to a six-day week (closed Tuesdays) with hours from 7:30 a.m. to 8 p.m. weekdays and 8 to 3 on weekends. If you are interested in specialty and organic grains and want to learn more, a three-day intensive course is being presented Nov. 3-5 in Champaign, Illinois, by The Land Connection, a non-profit organization that, according to its mission statement, “trains farmers in resilient, restorative farming techniques; informs the public about the sources of our food and why that matters; and works to protect and enhance farmland so that we, and generations to come, will have clean air and water, fertile soil, and healthy, delicious food.” The Speciality and Organic Grains course will be held at Prairie Fruits Farm and Creamery.